At the heart of the Discus range lies a uniquely powerful reporting capability. 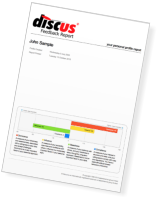 Discus profilers can provide some of the most extensive, insightful and comprehensive DISC reports available from any personality assessment. 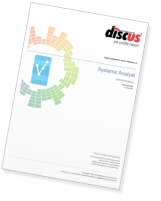 Discus can create a detailed personality interpretation from any set of DISC test results, using information-rich graphics and diagrams to present the results, as well as a relevant and readable textual analysis. Discus constructs its reports intelligently from a huge database of DISC knowledge, and is capable of producing literally millions of different behavioural reports. 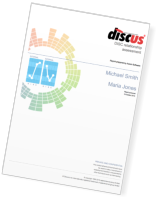 A Classic Discus report includes a full set of DISC graphs, a trait analysis, a detailed glossary and more besides. At the heart of the report, though, are ten sections of textual description in plain language, created using Discus' innovative expert system. 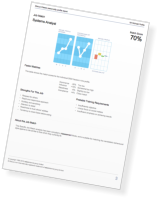 An Enhanced report contains all the same depth of content as the Classic version, but with an extra eleven sections of analysis. Also included online is a free personal Feedback Report for the candidate. How much is a Discus Profile Credit? A Feedback report is a broad overview of a personality written from the candidate's perspective, designed to give them feedback on their results. The report includes suggestions relating to personal development, as well as helpful career advice. 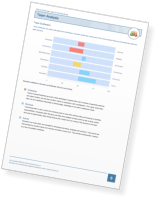 A Job Match report concentrates on a comparison between a candidate and a job, highlighting areas of particular suitability, as well as likely limitations. Also included is a textual summary of the job, and a breakdown of matches for other possible roles. A Job Profile is a model of the personality needs of a job or role, and a Job Profile report describes those needs in detail. The report will also match candidates to the role, helping you to find the best people for the job. A Candidate Match is similar to a Job Match, but works by finding the most suitable candidates from a pool you specify. This report looks in detail at one candidate's suitability, but also includes a breakdown of matches for other candidates. A Relationship report takes a candidate and examines the dynamics of their working relationship with another individual. The report looks at the relationship from both points of view, showing how each individual will work with the other. A Discus Team report gives you an extensive breakdown of the workings of any team. The report highlights the main dynamics within the team, the roles of different members, and also considers leadership issues.